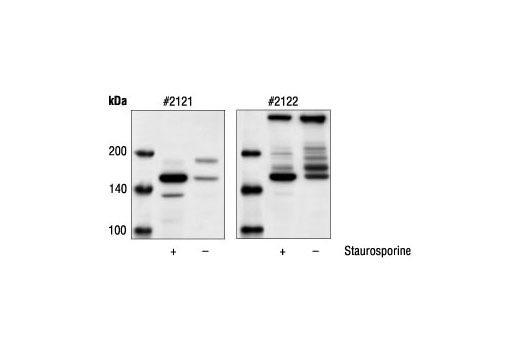 Western blot analysis of extracts from HeLa cells, untreated or staurosporine-treated, using Cleaved alpha-Fodrin (Asp1185) Antibody #2121 (left) and alpha-Fodrin Antibody (right). Alpha-Fodrin Antibody detects endogenous levels of full length alpha-fodrin (240 kDa) and its large fragment (150 kDa) resulting from cleavage at aspartic acid 1185. Polyclonal antibodies are produced by immunizing animals with a synthetic peptide corresponding to residues surrounding Asp1185 of human alpha-fodrin. Antibodies are purified by protein A and peptide affinity chromatography.